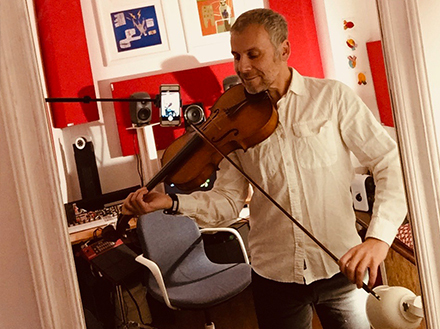 This week we talk to Simon Lyn, a composer and performer from Cardiff (via Canada) with a studio at Meanwhile House Cardiff. He uses his space as a place to compose, mix and market his music. Hey Simon, can you tell us how long you have had a space with Meanwhile Creative? Just over a year now, maybe fourteen months? 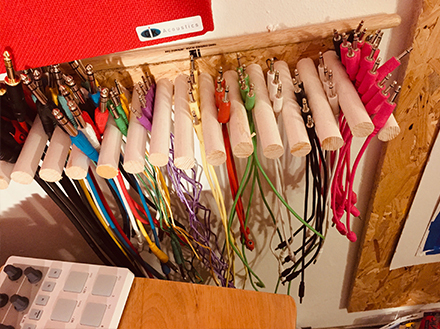 I’ve taken my time to arrange in it optimally for my workflow, before I took it on it was being used as a storage space. So for the past six months or so I’ve been working exclusively from here, and it’s working out great! And what is it that you do? I compose and produce original music for performance and moving image projects mostly via licensing, but also through bespoke commissions. That sounds intriguing! What has the space meant to you? 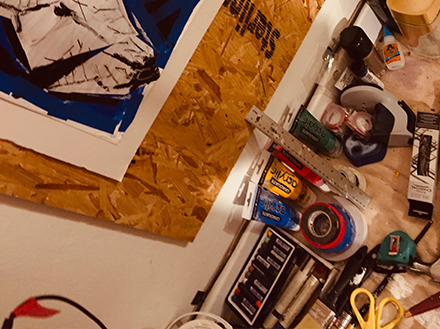 This isn’t my first commercial space but it is my first in Cardiff – it’s been instrumental in establishing my work and creative practice here 🙂 I’d recommend dedicated workspaces to others very enthusiastically! Just the ability to close a door and focus completely, to develop rhythm and routine around one’s business development is very freeing. 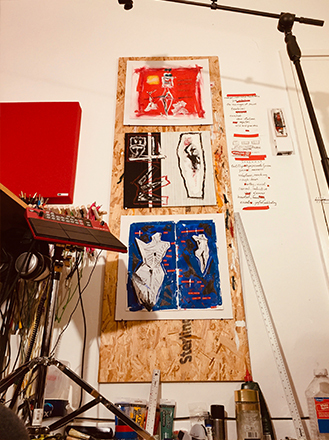 I’ve also set up a ‘painting station’ in my Meanwhile space – I paint my own artwork to partner the music, so this is really handy! Another benefit is that painting is an inspiring analogue for the way I want to compose – intuitively, quickly, with energy and momentum. So I often find myself moving between instruments and oil sticks; it’s a good energy. When I was sixteen my best friend was writing music for a production of Brecht’s The Caucasian Chalk Circle for the county youth theatre. Early on in the process he was taken ill and hospitalised, I went to visit and he asked me to step in instead … so I did, not really knowing what I’d got myself into (!) But all of a sudden I had a rehearsal schedule, a small team of musicians and a budget – I enjoyed the process enormously. Why did you choose Cardiff? When I decided to relocate back to the UK last year I chose Cardiff not just because I have many friends and family here, it’s also a city that offers a disproportionately high density of cultural opportunity – music of all kinds, film, TV, radio, theatre, dance, gallery and exhibition space – there’s a lot to enjoy! And as far as I can see the creative industries here are well supported by the public, the Arts Council of Wales and other funding bodies. Like many indie self-produced artists I’m normally a team of one(!) – composing, arranging, performing, tracking, mixing, mastering, marketing, digital strategy, administrating, making the coffee … it’s all on me! That said, there are times when I include other professionals – mix/mastering engineers, instrumentalists, licensing labels, etc. – but it all depends on the scope of the project, budget and audience. Every job has its ups and downs – what are the best bits of your job? Discovering the music a client really wants! 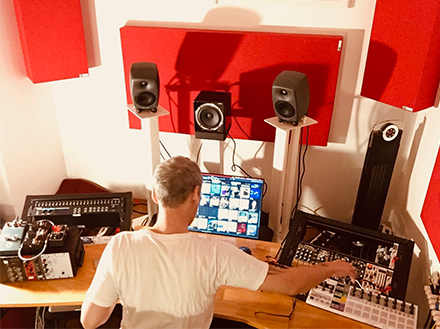 It’s hard to put into words the music you imagine for a project, even for a musician, and even if you can do that quite often it’s a sound or piece that comes out of left field that ends up being the right one. So the best thing to do is embark in a process of discovery together … eventually you find the right sounds! Looking back is there anything advice you would have given yourself at the beginning? And lastly, what’s new for this year? I’m about to release a 5-track EP, ‘bE ON uR ON‘, and then will take a completely new direction in my music making, which I’ve been carefully considering for a few years now … if things go well, I’d like to start Livestreaming concerts from my unit once or twice per week. educational arm to my practice, FLOW (Fearless Levels Of Wonder), which marries my interests in integrated arts programs and the Community of Enquiry developed in Matt Lipman’s Philosophy for Children program. 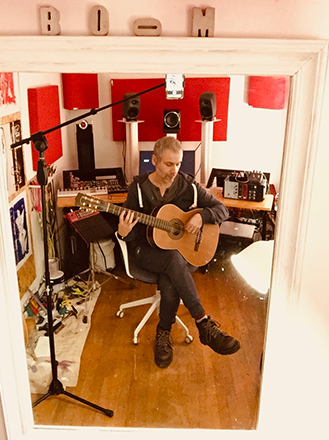 You can listen to Simon Lyn’s new EP here.